Green beans, also known as string beans or snap beans, are in the same family as shell beans, such as pinto beans, black beans and kidney beans. 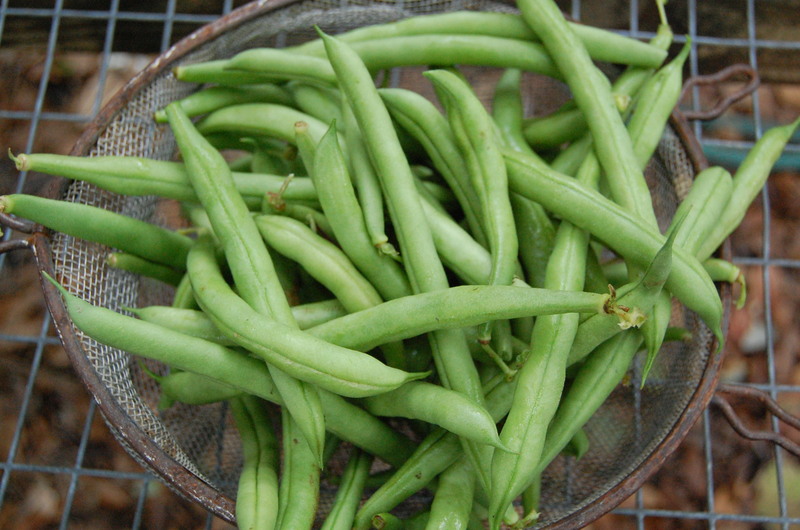 Yet unlike their cousins, green beans’ entire bean, pod and seed, can be eaten. Green beans range in size, but they usually average four inches in length and are deep emerald green in color. They contain tiny seeds within their thin pods. Green beans are fat, sodium, and cholesterol free. They are also a good source of Vitamins C, A, and K.
If possible, purchase green beans at a store or farmer’s market that sells them loose so that you can sort through them to choose the beans of best quality. Purchase beans that have a smooth feel and a vibrant green color, and that are free from brown spots or bruises. They should have a firm texture and “snap” when broken. Many people wonder about the possibility of freezing green beans, or purchasing green beans that have already been frozen. Both options can work—green beans are definitely a vegetable that can be frozen. We’ve seen several research studies on the nutritional consequences of freezing green beans, and most studies show the ability of green beans to retain valuable amounts of nutrients for 3-6 months after freezing. If you don’t have fresh green beans available on a year-round basis, purchasing frozen green beans can definitely provide you with a nutritionally valuable option. We recommend Healthy Steaming green beans for maximum flavor and nutrition. Fill the bottom of a steamer pot with 2 inches of water. While waiting for the water to come to a boil, rinse green beans. It is best to cook green beans whole for even cooking. Steam for 5 minutes and toss with our Mediterranean Dressing and top with your favorite optional ingredients. For details see, 5-Minute Green Beans. Store unwashed fresh beans in a reusable container or plastic bag in the refrigerator crisper. Whole beans stored this way should keep for about seven days. Freezing Green Beans: Rinse your green beans in cool water and then drain. Cut the ends of the beans off and then cut the beans to whatever length you prefer. Put the green beans into rapidly boiling water, cover the pot and boil them for 3 minutes. (You can re-use this water three to five times - but make sure it's brought back to a rolling boil). Use a large slotted spoon to remove the green beans from the boiling water and immediately plunge them into a bowl of ice water to stop the cooking. Keep them in the ice water for 3 minutes. Drain them well. Put the green beans into a reusable airtight freezer container or ziplock freezer bags. Make sure you get as much air out of the container or ziplock bag as possible to help prevent freezer burn. The first thing to do is get your jars and lids ready. Make sure the jars have no cracks or chips in the rim. More importantly check the jar lids. Do not use metal screw bands that are rusted or dented. You should use new flat lids every time you can. Sterilize the jars and lids. This can be done in boiling water for ten minutes or in the dishwasher using the sterilize cycle. Keep the jars in hot water before you use them. Wash the beans, trim the ends and cut the beans. Cut the beans to whatever length you prefer. Most people cut their beans 1 to 1 1/2 inches in length, some leave them longer, 3 to 4 inches. Put the raw green beans into a jar leaving one inch of space at the top for expansion during cooking. This is the time to add salt if you like, about 1/2 teaspoon. Slowly and carefully pour boiling water into the jar just covering the green beans. Use a plastic spatula to remove any noticeable air bubbles. Wipe the rim and place the flat lid and screw band tightly onto the jar. Don't twist the lid on with all your might, just snug them making sure they're tight. Don't twist the lids after the beans are cooked, this could break the seal. Note: For each 1/2 pound of raw green beans you are canning you will need a one quart jar. One bushel of un-prepared green beans will produce between 14-20 quart jars. If you are snapping the ends off, pull the end down the side of the bean to remove any possible string. Do the same thing with the other tip, pulling it down the other side of the bean. Boiling Green Beans: Boil a medium to large pot of water. Wash the green beans (see above) and throw them in the pot and boil for about 4 minutes. They'll turn a bright green color in the process. This will make a nice, crunchy bean. If you prefer yours mushy, boil them a little longer. Empty the beans into a colander to drain the water. Steaming Green Beans: The fastest method for cooking fresh green beans is to steam them (because it's faster to bring an inch of water to a boil than a whole pot of water.) Set a steamer basket in a saucepan with an inch of water in it and add the fresh green beans to the basket. When the water comes to a boil, cover the pan, reduce the heat a little, and steam about 4 minutes. The following nutrition information is for 3/4 cup of green beans (83 grams).